While less than stellar lead singers take the tarnish off this glittering jewel of a production, tremendous choral and orchestral work create welcome highlights. Theatrical staging wizard Graeme Murphy has overseen a fully integrated and expertly realised production, with all aspects of the art form combining for an entirely satisfying whole. Sets, costumes, projections, dance and general pageantry all significantly enhance the evening’s entertainment, without overwhelming the dramatic effect of the quieter scenes. A cavalcade of intriguing sets and spectacular costumes process by, easily maintaining audience interest throughout the almost three hour opera. Roger Kirk’s sets maintain almost constant movement, and when combined with lighting and projections it means that the same look never lingers for more than a few minutes. 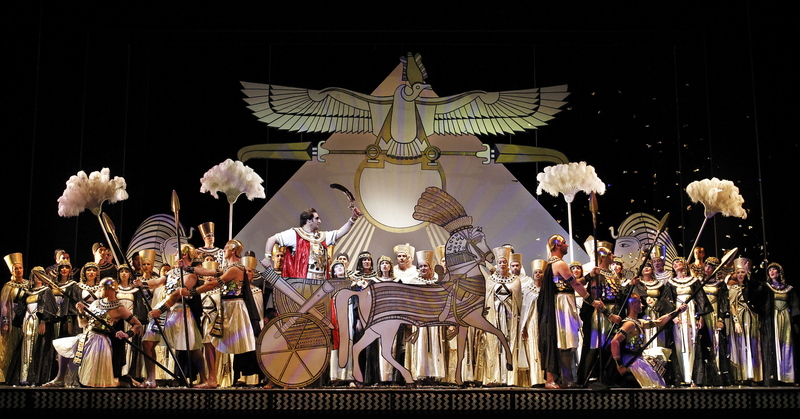 The main artistic inspiration is hieroglyphics come to life, which they literally do in the night’s most impressive sequence, the Triumphal March, in which the travellators carry clever combinations of matching set pieces and actors back and forth. Kirk’s costume designs are arguably the most beautiful in the current OA repertoire, with the leads in particular appearing in a range of ever more dazzling and jewel-encrusted robes. The black, white and gold colour palette creates a decadently sumptuous art deco feel, with well-chosen splashes, such as Radames’ red cape, adding extra interest. Congratulations go to Opera Australia’s costume and set maintenance staff for preserving and polishing the design elements so that they gleam as if brand new. Four years old is not a particularly high age anyway, but the sparkle of the costumes is notably pristine. Lighting by Damien Cooper creates plenty of atmosphere, and highlights the leads in crowd scenes with pinpoint accuracy. Projections by The Brother Gruchy add texture but even at only four years old already appear dated in quality. Hearty congratulations to Michael Black for his excellent preparation of the Opera Australia Chorus. Control overly dynamics is incredibly tight, with en masse diminuendos on some notes achieving an extraordinary precision. Pianissimo sections are suitably beautiful from the women or menacing from the men. Full volume pieces achieve an impressive power. The pre-interval bow for the chorus, and for the dancers, is very well deserved. Likewise, Maestro Renato Palumbo inspires Orchestra Victoria to a superb performance of the score. The delicacy of strings at times is heartbreaking, and the mighty power of the brass section is tremendous. On stage trumpet playing is quite thrilling. OA star basses Jud Arthur and David Parkin give reliably strong performances as King of Egypt and Ramfis respectively. Arthur is compiling the most extraordinary list of bass roles, achieving a commanding presence, interesting characterisation and, of course, magnificent sound each and every time he steps on stage. Parkin also continues to prove himself as strong and charismatic an actor as he is a singer. Both of these artists provide exceptional value to the company, with their names a welcome sight on any cast list. Further solid male support comes from Michael Honeyman as Aida’s father Amonasro. Baritone Honeyman sings and acts with strong focus, bringing suitable gravitas to the noble role. Also worth noting is the remarkable makeover Honeyman goes through, with his Rastafarian stage appearance completely contrasting with his pale, blonde headshot. Of the three central leads, Deborah Humble, as Amneris, acquits herself with a relative degree of success. Each lead singer is quite difficult to hear when performing anywhere but downstage centre, and over the chorus and louder passages of orchestral playing they do not have a chance. There is little, if any, chemistry between the three, with the main story only progressing due to Murphy’s clear staging of the central love triangle. Daria Masiero is a timid Aida, displaying only the one wide-eyed look on her face all night. Masiero is at her best in the stirring aria “O Patria Mia,” which is a definite vocal highlight. Humble shines in the Judgement Scene, when Amneris regrets the deadly impulse of her jealousy. Of particular disappointment is Carlo Barricelli as Radamès. Australia already has an outstanding Radamès: where was Rosario La Spina for this season? Barricelli produces snatches of volume with great effort, but most of his exclamatory moments are lost to the same dull tone heard throughout. 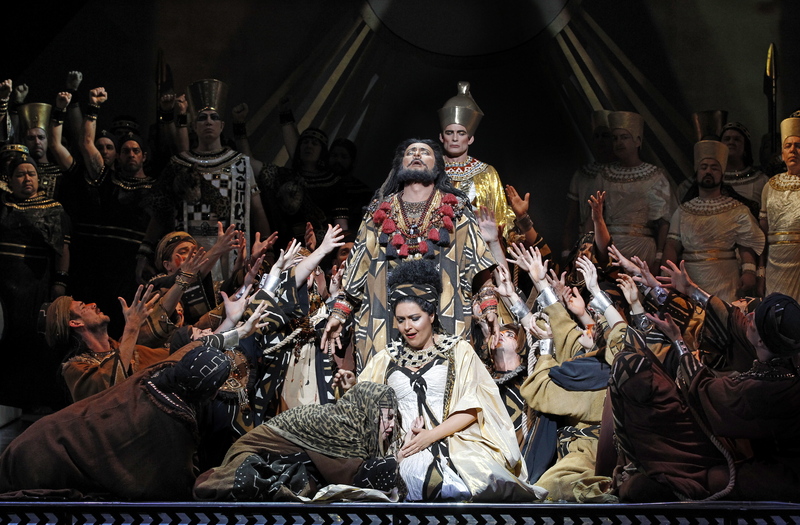 Barricelli’s facial expression is the same whether Radamès is being chosen to lead the army or accidentally giving its secrets away, and whether confessing his love to Aida or realising she has joined him in death. 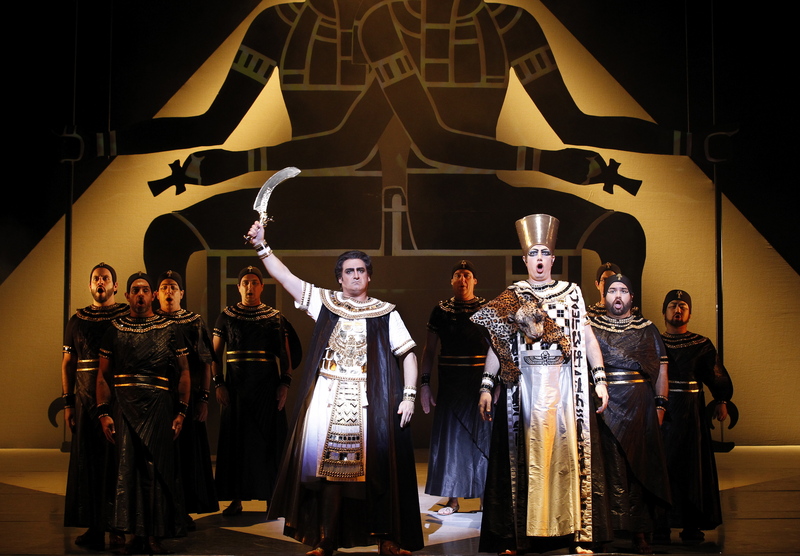 Aida continues at the State Theatre, the Arts Centre until 11 May 2013.